While the airplane is taxiing, or during take-off and landing, I have to turn off the electronic devices. Sometimes I remember to bring a book, but other times that means I have to look in the seat-pocket for entertainment. 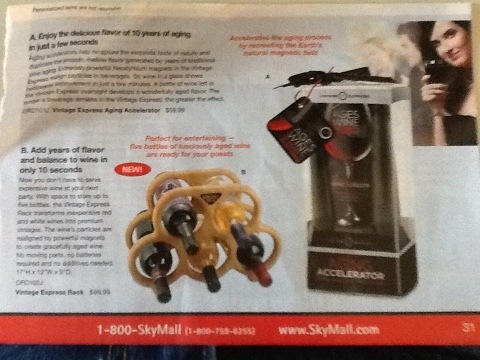 If the crossword puzzles and Sodoku are done (dear airline, please change the magazines more often) I end up reaching for the SkyMall catalogue. 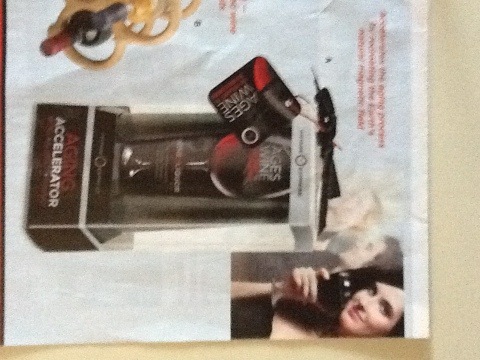 It is guaranteed to provide entertainment, from Star of David Christmas Tree topper (seriously! I am not making that up) to a genuine Harry Potter Magic Wand. 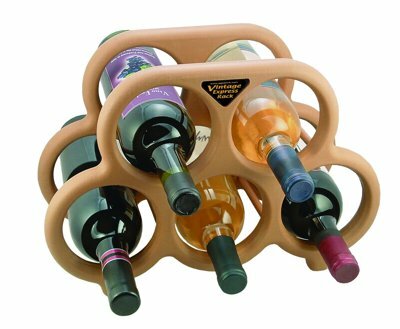 There is always something for the wine lover with a sense of humor. This time two entries from Vintage Express tickled the funny bone. If you don’t want to wait overnight, Vintage Express offers the Vintage Express Rack for just $99.99. 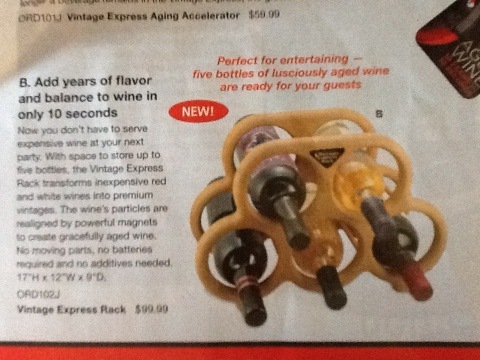 The Vintage Express Rack offers storage for five bottles, all surrounded by “powerful magnets to create gracefully aged wines.” The Vintage Express Rack may cost a little more, but just think of all the money you will save. 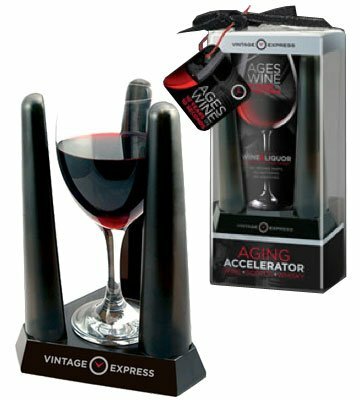 You no longer need to buy premium wine, because “the Vintage Express Rack transforms inexpensive red and white wines into premium vintages.” Through the power of magnets this marvelous device not only ages your wine, it actually changes the year of the grape harvest. Why spend all that money on a ’61 Margaux? Just buy the ’06 Pedesclaux and let the magnets do their magic! Speaking of magic, where was that Harry Potter Wand again? *Not really. That was sarcasm. What happened to buying a case and watching the wine evolve?